I am the last stop (!) on Heather Jones' Quilt Local blog tour.... How did we get to the end of this tour already? How time flies when you're having fun. Being here at the end I have had the pleasure to see all the lovely things said about Heather that came before me. I will jump right on that bandwagon, and add my appreciative words to the body of work that precedes me. I feel more than a little honored to be part of a tour that includes so many remarkable quilters. I am primarily a garment sewist, who has been lured into quilting by all the beautiful fabrics available....and the Modern Quilt movement. If you are new to this tour, welcome to the world of Quilt Local, Finding Inspiration in the Everyday, the beautiful new book written by the talented Heather Jones, and published by STC Craft, under the watchful and nuanced eye of Melanie Falick. This new book from the legendary publisher continues in the tradition of beautiful, informative, insightful, and inspiring, books from remarkable creators. The world of Craft books is wide and varied, but those that have been published by Melanie Falick stand apart from the pack. Heather has joined the good company of Denyse Schmidt, Natalie Chanin, Kristine Vejar, Rebecca Ringquist, and Sherri Lynn Wood, just to name a few. This is a remarkable distinction, and says volumes about the quality of Heather's work, before you even open the book. ....and then you start turning pages! Heather lets us peek behind the curtain of her creative process and what a beautiful world lurks there! While I feel I could write a full review of this useful and inspiring book, I will leave that process to the experts. Instead I am going to tell you why I think this book is cool, and important, and why I think you should get yourself a copy. When I first started quilting, just four years ago, I was incredibly excited about the process, but more than a little unfocused about how to go about it. I had a ton of fabric (as I'm sure you can relate to), and had a great time cutting it up and sewing it back together in new ways. I spent about a year in a flurry of non-specific creativity. It was a ton of fun. I made some lovely baby quilts. I bought tons of books, looking for pretty pictures, and ideas. Slowly some patterns emerged in my quilting. I am an improvisational quilter, who likes the loose structure of a block idea as a starting point. So I searched out books that worked in that theme. But I still felt unfocused. The novelty of what I was doing began to wear off, and I was able to step back from the mechanics of quilting and ask myself, why am I doing this? I began to slow down and study what others were doing with their quilts. How lucky are we modern-day quilters that we need only turn to our computer screens to find the work of others? I saw that many of the things I loved about quilts involved the story behind them, whether it was explained, or perhaps not. I am drawn to personal work, expressed in Quilts. So then I started looking more closely, and began to distinguish the hand of the maker in many quilts. It was kinda like my own personal scavenger hunt. Around this time I met Heather. We met at Quilt Market over a year ago, when Amy Butler requested her to come teach with Amy at a retreat I had planned. She walked up to me and introduced herself, and from that moment on we have been friends. You know how some people are just your 'people'? Heather is one of those for me. We do not live close to one another, as Heather is in Ohio and I am in Maine, but every time we are together there is such an easy,, gentle collaboration of conversation that I feel quite honored to have met her. It was being exposed to Heather's large scale, graphic, dynamic work that really helped me identify how much of each maker goes into every single decision made when a quilt is created. Heather and I are very different quilters. And I hesitate to even put myself in her company as a quilter, Heather is a dedicated artist when it comes to fabric, design, and the beautiful intersection thereof. I am a (dedicated) dabbler. I am also a fervent improviser, eschewing patterns for the most part. I basically NEVER plan a quilt out, certainly not on paper, before I start sewing. Heather on the other hand, starts with an idea, an inspiration, and from that initial spark, plays with color, and scale, and relation, and the use of space, with pencil and paper. She plots, she sketches, she erases, she sketches again. She seeks out color chips, and then arranges, and re-arranges, them till she gets the effect she desires. Holy Cow! What a different way to work from me! How thoughtful, how dedicated, how purposeful.... Sheesh! I am damn impressed! While our making styles differ, I find her process fascinating, informative, and inspiring. Threaded throughout the actual quilt patterns, are images of Heather's process. There are a couple of examples below. When you get your own copy of Quilt Local (which I highly encourage you to do), go look at the images on the first page of every pattern. Somewhere on each of those layouts in the book you will find at least one image from Heather's notebook of the original inspiration, and then some stage of her sketch work. Look closely at those images. (Like Cheryl Arkison, I too wish they were bigger) What you're seeing there? That's process. That's inspiration. That's work. That's a creative urge coming to life! It's kinda like seeing a rainbow-fleeting, beautiful, awe-inspiring, natural, dynamic, and pure. To me, right there is the jewel of this book. There is the glimpse into the creative mind. There is model for you to study, and from which to take some direction. Once you have found those tasty morsels, go back and look at the rest of the book. For there you will find gentle admonitions to creativity, always in Heather's supportive tone. I love (LOVE) her chapter on Color Theory, inspired greatly by Josef Albers, a hero to many who seek out knowledge about color. I love her pragmatic, and incredibly useful, tips about creative habits to encourage the creative muse to visit you: be aware; stay present; be open to surprising sources of inspiration; take photos and notes. Those four precepts are my new mantra! If you think about it this advice is good for most of life! I love the 40 (!) projects (two colorways for each quilt) that fill the book. But mostly I love the peek into the creative process of a woman I admire greatly. I love the place this book has taken in my library, so that whenever I am stuck, I can pull a little piece of Heather out, and let her help me find my muse. 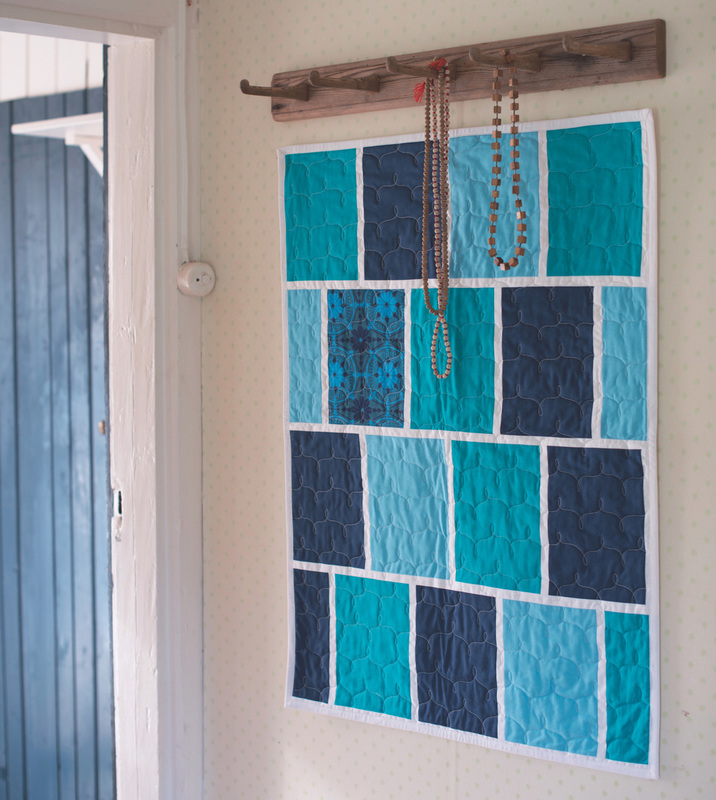 I do have a favorite project in the book, and that is the Shellshock quilt. It is the quilt Heather made inspired by a painting made by her husband, Jeffrey Cortland Jones. I love the personal resonance it so obviously has, but I also just LOVE that yellow. And the boldness of it....! Oh my. Doesn't that yellow just make you happy? The alternate version is a more subdued color palette, and although no less beautiful, it does not make me smile like the initial version. 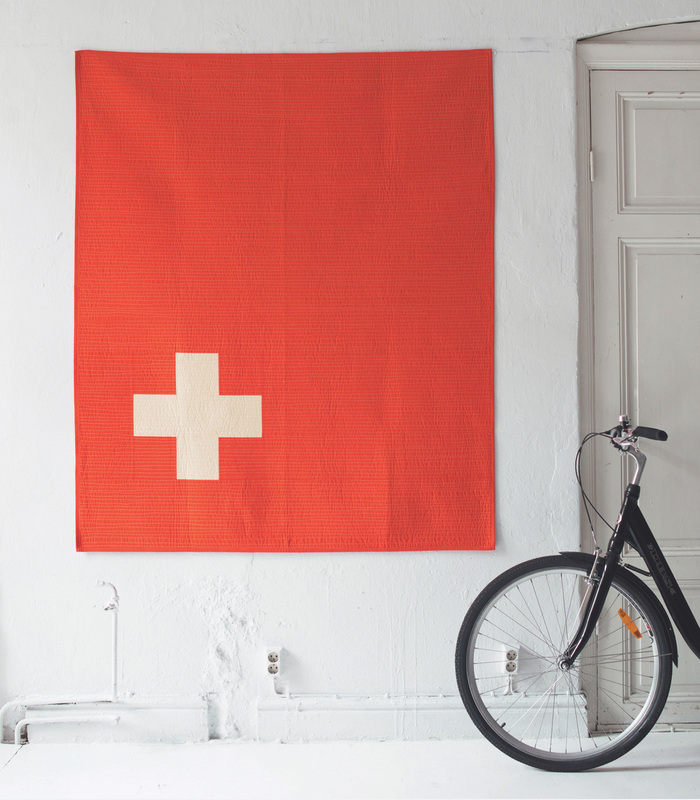 Oh the quiet, soothing, simplicity of this quilt....! I am giving away a copy of this book, because STC has generously given me that option, and I love this book, and this author, so much that I want to share it with everyone. So while I will just randomly (through a number generator thingie) give a copy away, I want to know how you find your inspiration? What prods you into making? How do you come to the cutting table, the sewing machine. What gets you there? Tell me your thoughts by the end of the day Monday (11/16 at midnight) and I will draw a name on Tuesday.